I think it is somewhat ironic that during "Rabbit Awareness Week" back in May a stray bunny was brought to Fairfield vets. Perhaps his previous owner became aware of just how much effort is required in looking after a pet rabbit and opted to let him fend for himself. 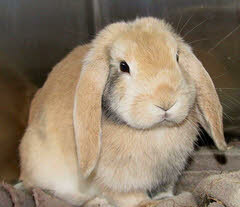 It can come as quite a surprise to many that the effort and expense in looking after rabbits properly is significant. A suitable fox proof home, an outside run, a healthy diet, vaccination against disease are but a few of the considerations. The reason why the "Rabbit Awareness Week" campaign is supported by the RSPCA is because so many rabbits are caused a great deal of unnecessary suffering through ignorance and neglect by the owners. With so much information now available at the touch of a button ignorance should now never be an excuse. Fortunately, at Fairfield, we have recognised the increasing demands of owners to have their rabbits treated to the same high standards as other pets. Consequently, we have benefitted tremendously from our colleague Aga's enthusiasm and dedication in her thirst for knowledge to best treat the increasing number of conditions that rabbits are now known to suffer. As a "prey" animal rabbit's resources are focused into hiding any potential weakness or illness from a "predator" making it extremely difficult for diagnosing clinical problems. "If only they could talk" was never more valid than when applied to rabbits for it takes a certain type of patience to translate their very restricted vocabulary. I have enough trouble translating my own. . . and am therefore more than happy to defer to my learned colleague without having to twitch my nose!